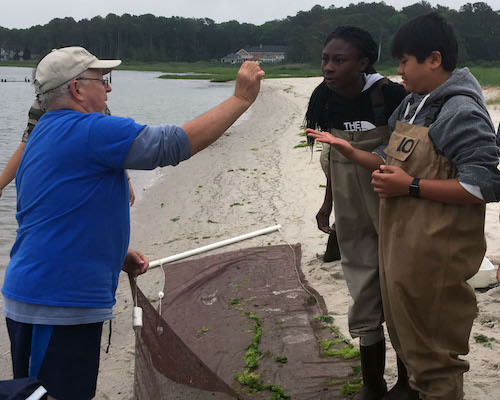 Ocean View, DE: The James Farm Middle School Program, a partnership between Indian River School District and the Delaware Center for the Inland Bays (CIB), has just wrapped up it’s 18th year educating local students about water quality, wetlands, and other local ecosystems! Serving approximately 1,400 students annually, the Program provides a unique experience to area 7th and 8th graders, some of whom have never visited the bays which are located right in their backyard. At a time when smartphones and tablets increasingly disconnect us from the natural world, this program strives to reconnect students to the world right outside their classrooms. “We are continually encouraged by the enthusiasm of our students, seeing and experiencing first hand what they have discussed in their classrooms,” said James Farm Program teacher, Dennis Bartow. “For many it is their first time experiencing the ecosystems of the Inland Bays and they just love it – so do we! The James Farm Middle School Education Program is an ‘extension activity’ aligned directly with the school’s science curriculum. After learning concepts in the classroom, students come to the James Farm to put them their knowledge to practice. They take soil samples, measure water quality, and even use a ‘seine net’ to catch and sample fish, crabs, shrimp, and other creatures found in the Indian River Bay. Even though finding adequate funding for such programs can be challenging due to the state budget shortfall and corresponding cuts to school district funding, the Delaware Center for the Inland Bays is committed to developing sources of funding to support the program’s future. It is our hope that public support for the program will continue, so we can continue to offer this experience to future students. We also hope that when students leave the James Farm, they continue to explore the outdoors, remembering that they are part of this beautiful, natural world and will become advocates for protecting and restoring the Bays in their own backyard.